Update: I’m no longer using the Vizio television for my gaming needs. I upgraded to a newer tv last year that is 4K capable. I will talk about this new television soon so please check back. There are a lot of good high definition televisions out there that are wonderful for playing video games on. 1080p and LED screens are pretty much the norm these days and there are quite a few choices when it comes to that. There are also the newer, but sometimes pricier 4k televisions out now. I do have a couple of high definition televisions I play games on, but a fairly new one that I play my PS4 on is the focus here today. Vizio started out as a low budget flat panel television company (value brand as they call it) for those that just couldn’t afford the more well known brands. Vizio has been around since 2002 and today is among the top tv sellers in the United States. Their televisions used to be mainly sold at Wal Mart and Costco, but now are also being sold at Best Buy. It is Best Buy where I had purchased the 42″ LED M series by Vizio. It was kind of a tough decision because I was also leaning towards a Samsung 3D television. The only thing that kept me from getting the Samsung was the 3D as I don’t like the active 3D glasses that require batteries in which that high definition television requires. I have a 3D television that uses passive 3D and its glasses don’t require batteries, but I’ll talk more about that another time. 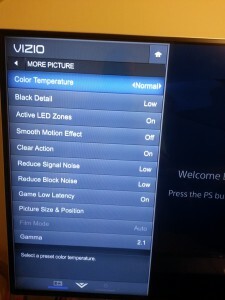 The Vizio M series is one of the newest models that the company released in 2014. The M series comes with very hefty specs that can certainly compete with the stronger, more well known brands, but at more affordable prices. There are a few different sizes of the M series that range from 80″ all the way down to 32″. I couldn’t stand any longer the much smaller 24″ budget brand television I had in my room for a few years. I wanted to enjoy the open world games I play on my PS4 on a bigger tv that would better bring out the wonderful 1080p greatness of the PS4 games. 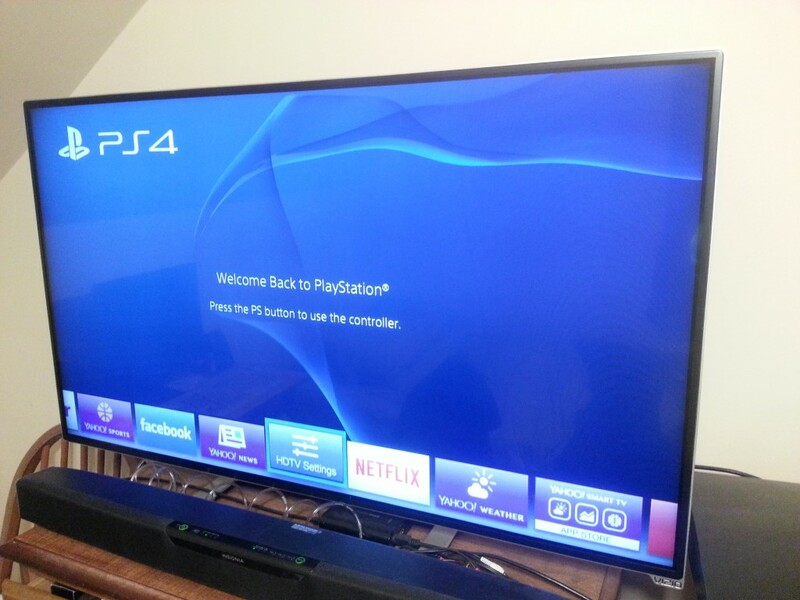 The 42″ television was just the perfect size for my room and can easily showcase the graphical power of the PS4 games. 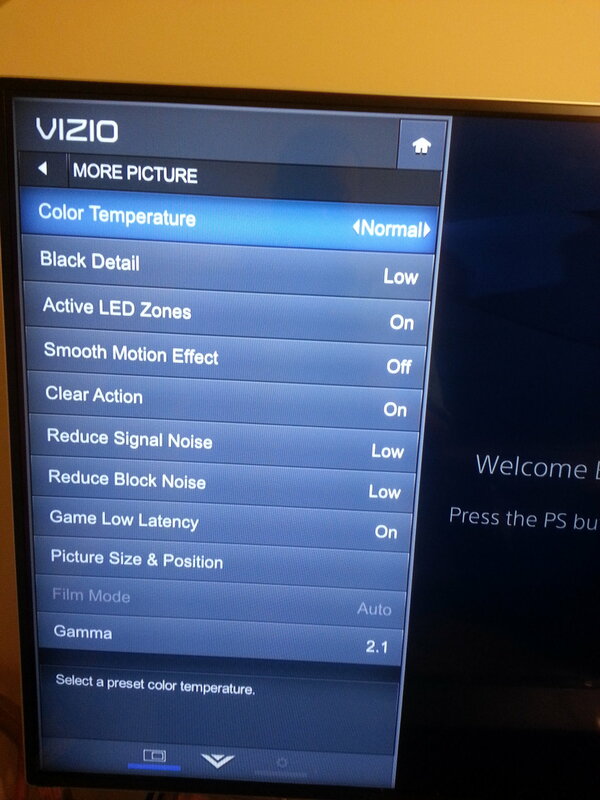 As I mentioned earlier, the specs of the 42″ Vizio television are pretty strong. It is 1080p, has a strong 240mHz refresh rate which is faster than my main television downstairs, and has a full-array active LED panel. Basically what the full-array LED panel does is give you far deeper blacks and brighter colors when present for a very clear and deeply detailed picture. It really is amazing the level of detail you see on this television. A few other things it has is built in Wi-Fi so that once you connect it once via your password to your home network, it’ll automatically connect to the Wi-Fi and can download updates or possibly new apps that can be added to the Smart Apps menu included in the TV. Some apps that are included are Netflix, Hulu Plus, Pandora, Facebook, Spotify, and more. It makes it nice to have a different variety of apps on there so you can watch all kinds of different videos and movies as well as listen to radio through the television. This M series television comes with some of the latest connections to easily connect to your devices such as HDMI, Component, Composite, an Optical port for digital audio, a USB input, audio out ports, cable/antenna (digital antenna), and an Ethernet port. 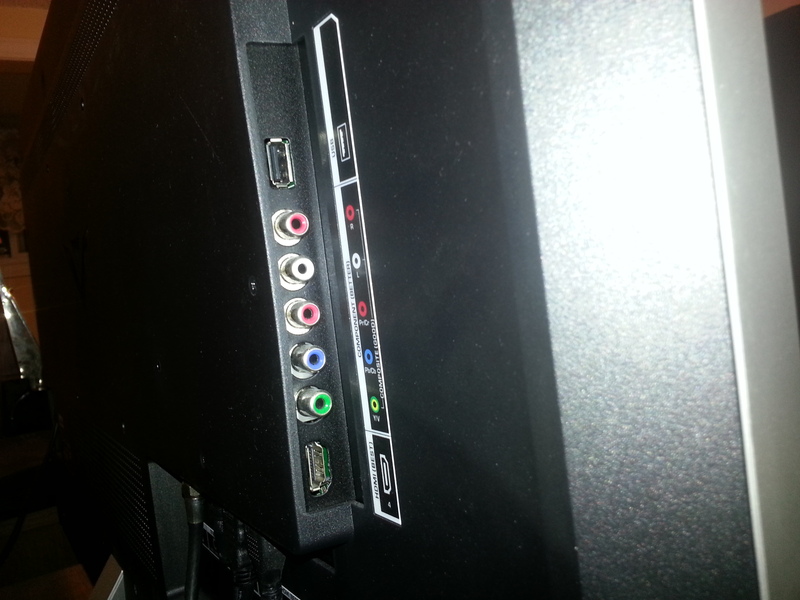 There are a total of 4 HDMI ports on the tv set, 1 on the back left side of the tv, and the other 3 just further down. 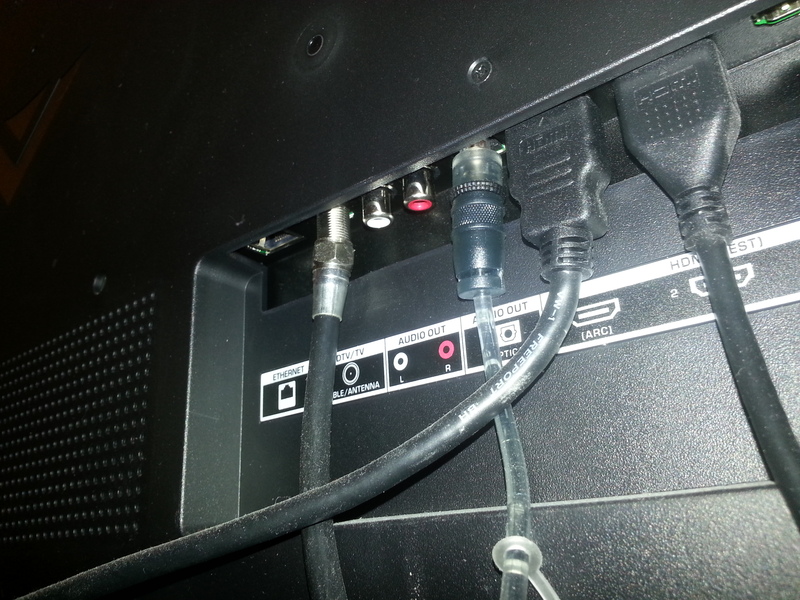 Probably the only slight mark I would give against this television is the lack of a port for headphones. I think most of the newer and larger models no longer include one, but it is something I actually miss from my former and smaller tv. It came in really handy at night since I do have a roommate and don’t want to wake him at night if I want to watch a movie or something. 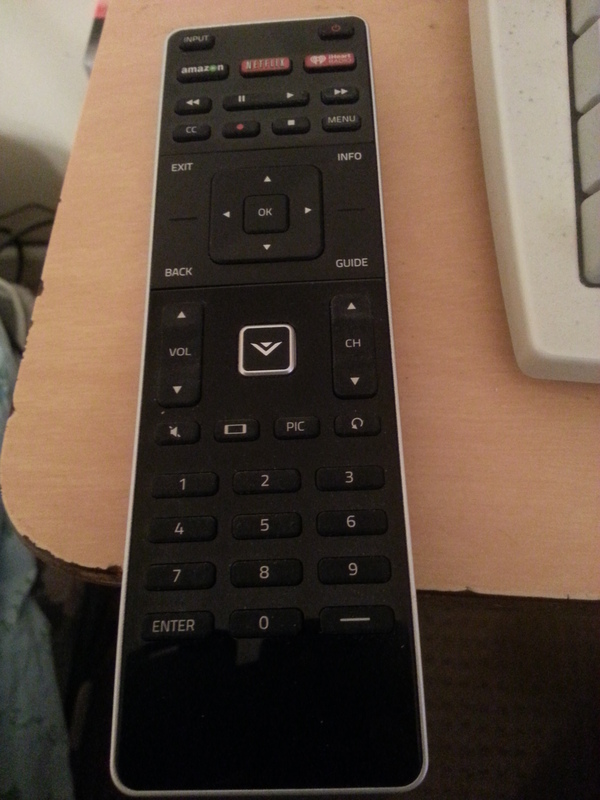 The remote is pretty nice with 3 app buttons near the top which are Amazon Video Plus, Netflix, and IHeart Radio. 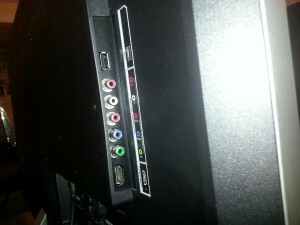 Right below that are buttons that can control a movie you are watching on any of the apps and even a Blu-ray player. In the center of the remote is a button with the Vizio symbol that you can press and will bring up the smart app bar where you can choose any of the apps on there or hdtv settings. 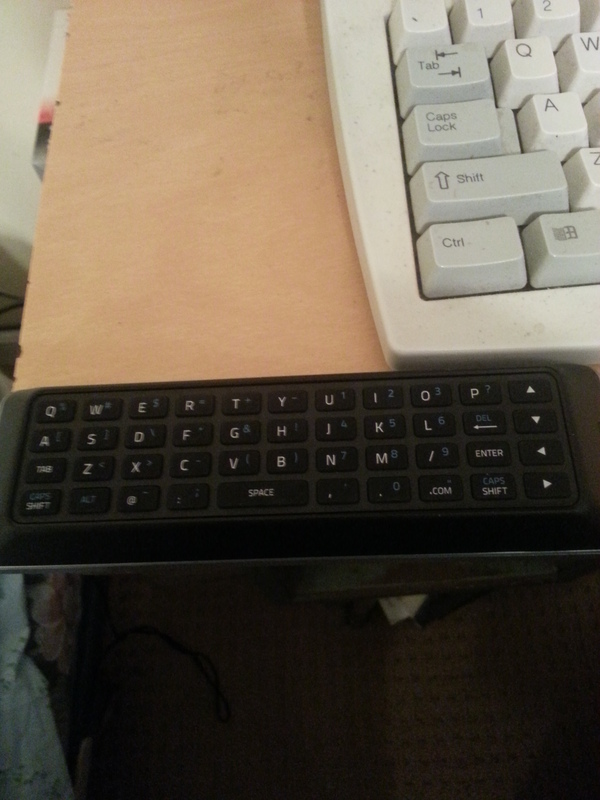 Another nice thing is that when you flip the remote over, it has a nice Qwerty keyboard that can be used to quickly type in something you may be looking for in one of the apps. It makes it easier and quicker to use than say the on screen keyboard on some of the apps. It does come with 2 AAA batteries so no need to go out and buy some. As with most high definition televisions these days, there are different menu settings to calibrate the tv the way you want it to look. 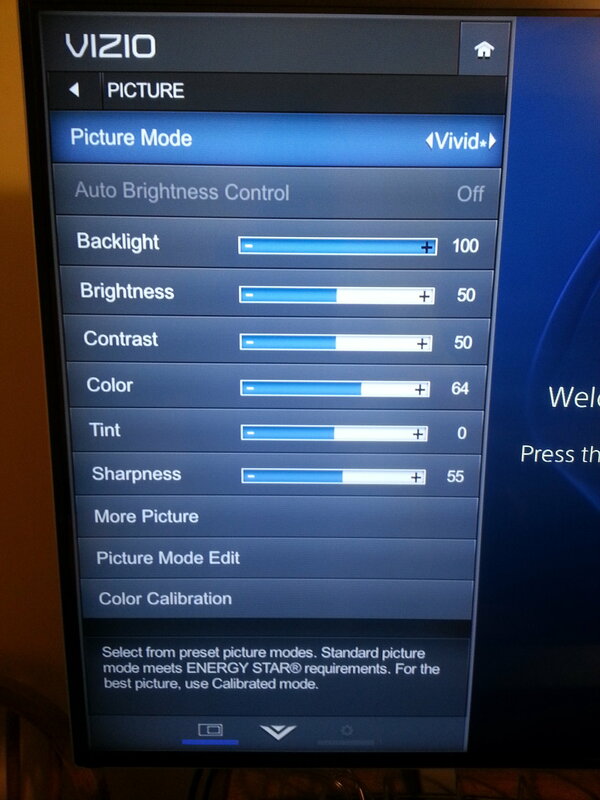 The menu is pretty easy to navigate especially when it comes to picture settings of the tv. 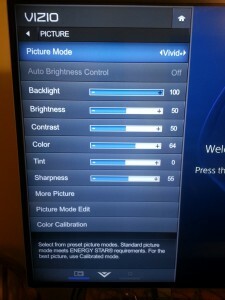 When you choose Picture Mode, you have some pre-loaded and calibrated settings for instance Vivd, Computer, Game, and a few others. I like alternating between them from time to time to see the different looks when either playing a video game or watching a movie. If you don’t have a lot of experience calibrating, it is definitely best to use one of the preloaded settings or even go online to search for calibration settings that will match what you want to see on the tv set. One thing I like is that you can turn on and off what is called Smooth Motion Effect. This is what many refer to as the soap opera effect which makes it feel like it is being filmed live in front of an audience. I’ve never really been a fan of it, and to me it sometimes seems like there is some blurring or ghosting in parts when this is on. Others love it as it gives a different look and feel to their favorite movies. To each their own, I just prefer to have it off. Another thing I need to mention is the sound. It comes with built in speakers in the back of the set which are decent, but if you want really excellent sound that is similar to the theatres, you still need to connect it to a home theatre system or a sound bar. I don’t want a home theatre system at this time so I’ve settled for a sound bar and have it connected to the audio optical port. It definitely makes a big difference and the sound when watching a movie or playing a game is very nice. I can definitely rattle the walls with the sound bar! I’m very happy with this high definition television. Yes, the new 4K televisions are really now hitting stores in force, but there is still not a lot of content out yet to support that resolution not to mention the newer game systems do not support 4k resolution in its games (though video playback is a different story). Until there is a lot more content out there and the devices to support 4k, 1080p is still the best way to go for now in my opinion. The tv has a fast refresh rate for smooth and fast action, deep blacks and contrast, great color, full LED array and a plethora of smart apps to choose from. This Vizio M Series 42″ LED can definitely keep up with the likes of bigger name brands these days and for a better price. I did get this at Best Buy back in August of last year and it is now on sale for $399 about $100 cheaper than when I bought it. You should definitely get it as it is a perfect size television for a bedroom or even a kitchen. It easily gets 5 stars from me. Very thorough review, thank you. Well done. There is allot of good information here. It reads well and shows that you know TVs and competing brands. I like that you were able to acknowledge the quality of the Vizio and purchased it over a Samsung after your evaluation.